A good level of development (GLD) at the end of the early years foundation stage (EYFS) is a key measure of primary school effectiveness. A child is deemed to have attained a good level of development if they attained at least the expected level of within the three prime areas of learning and within literacy and mathematics. Within SIMS, most schools already record the EYFS profile results at the end of reception. So this year’s reception pupils will be given a judgement of emerging, expected or exceeding against the seventeen early learning goals. SIMS records these judgements as 1 (emerging), 2 (expected) or 3 (exceeding). For most schools this data will be available for current year 1 pupils through to year 4 pupils. For 2017 Capita have provided a marksheet template that brings together each of the areas of learning, indicates if a the GLD has been attained in the individual areas and in the overall EYFS. This information is then used by a set of easy to run reports to allow deeper analysis. Before you start, run the EYFS Profile Wizard 2017 (Tools | Performance | Assessment | Wizard manager). This will make sure that the template called ‘EYFS Profile Good Level Development 2017’ is installed in your system. You’ll see a group browser, that lists all the different groups that we could use to populate our marksheet. Choose ‘Year Group’ and then tick the reception year. Also tick year 1, year 2, year 3 and year 4 – this will allow you to calculate the EYFS GLD status of these other year groups. You now have a set of marksheets for all recent year groups. Unless you are following these instructions during the summer term the current group of reception pupils won’t have any results yet, so we’ll use year 1 as our example and show you how to use the marksheets. You should see that all the results for the individual learning areas have been brought in from the original EYFS return. If you don’t see any results it’s probably because your school didn’t use SIMS for that year’s EYFS results. If you didn’t record your EYFS results in SIMS at the time, you can enter them directly into the marksheet now. Press the calculate button to discover which pupils had a good level of development. The coloured Y/N columns show GLD across Communication & Language, Physical Development, PSE, Literacy and Maths. The final coloured column ‘GLD Achieved’ is the important one and shows the pupils who attained the GLD across all the key areas. Note that the coloured columns contain a green ‘Y’ if the pupil was given a 2 or a 3 in all the areas relevant for that goal. 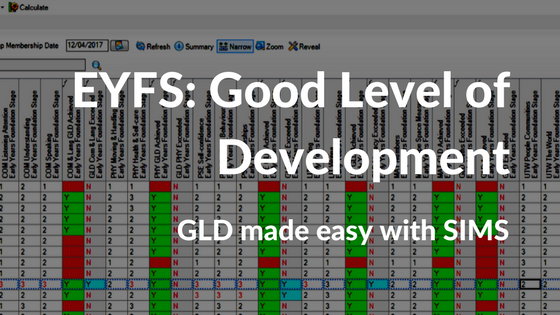 The ‘GLD Achieved’ column will only contain a green Y if there is a Y in all the other columns. Next to the coloured columns there are also a set of Yes/No columns that indicate if the GLD has been exceeded. This will show a blue ‘Y’ but only if the pupil attained a grade 3 (exceeded) in every single one of the elements that make up the individual goal. At the right hand side of the marksheet you also see the 5 learning goals not included in the calculation of GLD and a final column which indicates if the pupil attained GLD in all 17 areas (not just the key areas). A point score is also provided to help you analyse the data further.